In February 2012 7 year old Shay suddenly lost his father to a heart attack. Shortly thereafter, Shay decided that he wanted to take part in the American Heart Association Heart Walk in memory of his dad and to help people like him. So, Team Doug’s Heart was born. Shay fundraises pretty much year round and recruits family and friends to join him for the Heart Walk each spring. Since March 2012, Shay has raised over $18,000 for the American Heart Association. We remember the first time Shay and his mom walked into Val’s to order shirts. Shay had drawn a beautiful picture of him and his dad to go on the shirts. 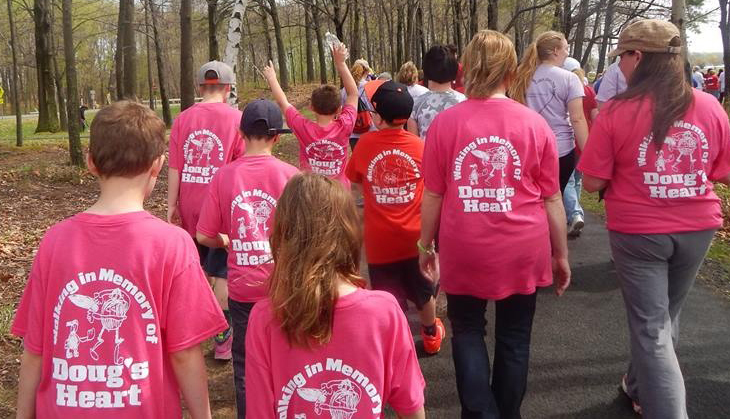 We are so thankful they chose us to create their special shirts and are happy to be a part of Doug’s Heart each year!